What is my Chance of winning in the Green Card Lottery? Can I do something to increase my chances of winning? How do I know if I won a green card? How can I participate in the USA Diversity Visa Green Card program? Are there any new requirements for this year’s green card Lottery? Year 2019, Green Card Lottery Program DV2021, what is going on? What year is this USA Diversity Visa Green Card Lottery program? How can I get My USA Diversity Lottery Username and Password? What are my photo(s) options? How many photos do I need to upload/send ? Is it safe to use credit/Debit card online ? Can I pay cash or by Western Union Transfer or any other way? What is USA Diversity Lottery’s refund policy? The Green Card is an immigrant visa to the United States. It allows you to legally live, work and study in the United States and to enter and leave the country freely. Green card holders also receive health, education, and other rights, and they can sponsor relatives for Green Cards. A permanent resident is someone who has been granted authorization to live and work in the United States on a permanent basis. As proof of that status, a person is granted a permanent resident card, commonly called a “green card”. What is the Green Card Lottery program ? The chance of winning in the Green Card Lottery program depends on your country of birth or your country of chargebility. To find the exact chance of winning in the green card lottery click on: Green Card Lottery Winning Chance. Who can participate in the Green Card Lottery ? The applicant must be a native of a country whose natives qualify and must meet either the education or training requirement of the program. To check if you qualify, go to the green card lottery requirements page. What about my spouse and children ? Is there a minimum of age to apply ? What are the requirements for the education or work experience ? You must have at least a high school education or its equivalent or, within the past five years, have two years of work experience in an occupation requiring at least two years training or experience. A "high school education or equivalent" is defined as successful completion of a twelve-year course of elementary and secondary education in the United States or successful completion in another country of a formal course of elementary and secondary education comparable to a high school education in the United States. Occupations that require at least two years of experience are determined from a list published by the Department of Labor. The DV-Lottery Requirements page will walk you through these options. Why do natives of certain countries not qualify for the green card lottery ? The Green Card Lottery is intended to provide an immigration opportunity for persons from countries other than the countries that send large numbers of immigrants to the United States. The law states that no green cards shall be provided for natives of “high-admission” countries. The law defines this to mean countries from which a total of 55,000 persons in the Family-Sponsored and Employment-Based visa categories immigrated to the United States during the previous five years. Each year, U.S. Citizenship and Immigration Services adds the family and employment immigrant admission figures for the previous five years to identify the countries whose natives will be ineligible for the annual green card lottery. Because there is a separate determination made before each annual green card lottery entry period, the list of countries whose natives are not eligible may change from one year to the next. What can I do if I was born in a country that is not qualified ? if you were born in a country that is not eligible for this year’s green card lottery program, you may claim chargeability to the country where your derivative spouse was born, but you will not be issued a green card unless your spouse is also eligible for and issued a green card, and both of you must enter the United States together with your green cards at the same time. In a similar manner, a minor dependent child can be “charged” to a parent’s country of birth. Finally, if you were born in a country not eligible to participate in this year’s green card lottery program, you can be “charged” to the country of birth of either of your parents as long as neither parent was a resident of the ineligible country at the time of the your birth. In general, people are not considered residents of a country in which they were not born or legally naturalized if they are only visiting the country, studying in the country temporarily, or stationed temporarily in the country for business or professional reasons on behalf of a company or government from a country other than the country in which the applicant was born. If you claim alternate chargeability, you must indicate such information on the green card lottery online Entry Form in the members area. Please be aware that listing an incorrect country of eligibility or chargeability (i.e., one to which you cannot establish a valid claim) may disqualify your entry. Your country of eligibility will normally be the same as your country of birth. Your country of eligibility is not related to where you live. “Native” ordinarily means someone born in a particular country, regardless of the individual’s current country of residence or nationality. For immigration purposes, “native” can also mean someone who is entitled to be “charged” to a country other than the one in which he/she was born under the provisions of Section 202(b) of the Immigration and Nationality Act. How many applicants will be selected ? How many entries can I submit ? The law allows only one entry by or for each person during each registration period. Individuals for whom more than one entry is submitted will be disqualified. The Department of State will employ sophisticated technology and other means to identify individuals who submit multiple entries during the registration period. People submitting more than one entry will be disqualified, and an electronic record will be permanently maintained by the Department of State. Individuals may apply for the program each year during the regular registration period. However, married couples may each submit an application, doubling their chances of winning. The Diversity Visa Lottery Registration page will automatically suggest this to you. Can I do something to increase my chances of winning ? Yes and No, all qualified entries are randomly selected by computer and have an equal chance to win, however if you are married you and your spouse can both apply and you will double your chances of winning. What you can do is make sure that your application is not disqualified. Each year millions of applications are disqualified for failure to follow the submission requirements. The online DV-Lottery Registration page will create the application for you and help you avoid this. How many visas are distributed to each country ? I live in the U.S. - Can I participate ? May a husband and a wife each submit a separate form ? Yes, a husband and a wife may each submit one entry. If either were selected, the other would be entitled to derivative status. Therefore, you may double your chances by submitting one application for each of you and listing each other as spouses or save a little money and use our husband/wife application that does the same for a less money. If I win, do I have to travel with my family ? At the Kentucky Consular Center in Williamsburg, all entries received from each region will be individually numbered. After the end of the registration period, a computer will randomly select entries from among all the entries received for each geographic region. Within each region, the first entry randomly selected will be the first case registered; the second entry selected the second registration, etc. All entries received during the registration period will have an equal chance of being selected within each region. When an entry has been selected, the entrant will be sent a notification letter by the Kentucky Consular Center in Williamsburg, which will provide visa application instructions. The Kentucky Consular Center in Williamsburg will continue to process the case until those selected to be visa applicants are instructed to appear for visa interviews at a U.S. consular office or until those qualifying to change status in the United States apply at a domestic USCIS office. Important Note: Selectees will NOT receive a letter through their country's postal service or any email or phone call from the US State Department notifying them of their selection. Entrants, who are not selected for further processing in the green card lottery, will not receive any type of notification through mail or email from the US State Department. It is the applicants responsibility only, to check them self on-line if they won in the green card lottery and if you won you must print and submit several immigration applications forms as soon as possible. Being selected in the Diversity Visa Lottery does not automatically guarantee that you will receive a green card. 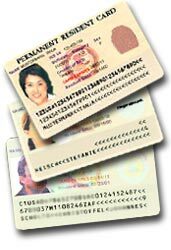 Each year, more lottery winners are selected to apply for green cards than there are green cards available, so it is important that selectees act promptly.Should you receive an email notification about your green card lottery selection, be aware that the message is not legitimate and a fraud. Applicants can check on-line each year on May 1, if they were selected and in their winner notification, if selected, will be provided further instructions on how to claim their Green Card, including information on fees connected with immigration to the U.S. Persons not selected will NOT receive any instructions, only the message that they were not selected. In order to participate the USA Diversity Visa Green Card lottery program please complete the online registration process at: Register for the Green Card Lottery. What information is required to fill in the application ? You are required to provide the name, date and place of birth of yourself, your spouse (wife or husband) and your children (unmarried under 21 years of age); your full mailing address; recent photographs of yourself, your spouse and children. The online Do I Qualify page page will walk you through all of the information you need. What family members must I include on my entry ? Is the photograph required for each family member ? Yes. A Recent and individual photographs of you, your spouse, and all children under 21 years of age are required. Family or group photographs are not accepted. Refer to information on the photograph requirements for specific details. Are there any specific formatting requirements for the entry, envelop, photos etc ? Yes there are, the Photo page and instructions will guide you through these requirements. Yes, you must provide an email address this year as part of your entry, it is no longer optional. If you are selected, you will still receive an official letter from the Kentucky Consular Center in Williamsburg by regular mail, but the Kentucky Consular Center in Williamsburg may send other communications to you by email. Please provide a personal email address that you can access rather than using someone else’s address or a standard company address. Year 2019, Green Card Lottery Program DV-2021, what is going on? This year’s (2019) Green Card Lottery Program is called DV2021 (the year successful applicants may enter the United States of America) and is scheduled to be closed for applications at November 7, 2019. What year is this USA Diversity Visa Green Card Lottery program ? Submission - Applicants can apply for the DV-2021 program on our web site now and until November 7, 2019. Lottery - March 2019 - Winners are chosen by the Kentucky Consular Center in Williamsburg and can check on-line if they were selected between May 1, 2019 and April 30, 2021. Process - Winners apply for Green Card using their winning notifications. Entry - Green Card holders who won the green card lottery may enter the United States of America during the year 2021 as a permanent resident. Who is USA Diversity Lottery ? The USA Diversity Lottery service was set up to provide information about the Diversity Visa Lottery Program and assist individuals with preparation of their application forms. Each year, millions of applications are disqualified because they fail to meet the strict submission requirements. The Check if You Qualify page walks you through the eligibility requirements making sure you provide all of the required information. The Organization enables non-American users to apply for the American Green Card Lottery Program online helping them in making sure their Green Card Lottery Application Qualifies to participate. The USA Diversity Lottery Organization is not an American Government related agency, but a professional Independent Organization. How much time does it take to complete the online registration process ? The entire registration process should take you around 15 minutes. How much does the online service cost ? The administrative fee is based on the number of entries you sign up for - in order to increase your chances if you are married, we suggest you should submit either separate applications for yourself and your spouse or a combined husband/wife application (the Green Card Lottery Registration page will automatically suggest this and other options). You may also register for automatic resubmission for the upcoming years, new submission instructions are posted by the US Government. If you select this option, the service will automatically check and create your application in compliance with the new instructions. However, you will need to resubmit your photo each year to make sure the most recent photo of yourself is submitted. Can I call USA Diversity Lottery ? What is my user name and password ? In case you forgot your username and/or password, please go to USA Diversity Lottery website http://www.usadiversitylottery.com and click on Contact Us and use the option "Forgot your password?". How can I get My USA Diversity Lottery Username and Password ? Kindly note that in order to complete your application and get a username and password; you must pay on line using your credit card. Please visit the following link: Register Now! What are my photo(s) options ? You can either: (1) Upload your electronic pictures from your online account, OR (2) Send regular applicant passport photos to USA Diversity Lottery by regular mail, attaching them to the photo page you are asked to print in the member area. You should send/upload only one photo for each family member that you add to your application. Note: you must add your spouse and unmarried children under the age of 21. In accordance with the new State Department rule for the green card lottery program, USA Diversity Lottery now requires that only one Application/Photo form be sent. If you have already sent one complete form with all the photographs, there is no need to send us any more material. Yes. The service is fully secured by the highest-level industry standard SSL 256 bit encryption offered by Authorize.net, which prevent exposure of your credit card number and other personal data to anyone but the USA Diversity Lottery credit card company server. Why is my credit card not accepted ? In order to use our on-line registration process, you must hold an International Credit Card (Visa, MasterCard, Diners Club, American Express or Discover). Can I pay cash or by Western Union Transfer or any other way ? The fastest way is to pay the service fee by using a valid International Credit/Debit Card. Other payment methods are available, such as Cash, Western Union or Cashiers Check. What is USA Diversity Lottery’s refund policy ? Refunds will be given at the discretion of the USA Diversity Lottery Management. Fee paid is NOT recoverable if filing of the lottery application is made impossible by any events beyond the control of USA Diversity Lottery Organization. (For example, including but not limited to Act of War, Acts of Nature, Technological Limitations, Economical Resources, Legislative or Procedural Changes and/or State Action). The congressionally mandated USA Diversity Green Card Immigrant Visa Program is administered on an annual basis by the Department of State and conducted under the terms of Section INA §203 of the Immigration and Nationality Act (INA). Section 131 of the Immigration Act of 1990 (Pub. L. 101-649) amended INA §203 provides for a class of immigrants known as "diversity green card immigrants". Section INA §203(c)(c) of the INA provides a maximum of up to 55,000 Diversity Green Card Visas (DV) each fiscal year to be made available to persons from countries with low rates of immigration to the United States. For many people wishing to achieve the dream of living in America, the Green Card Lottery program offers the only chance for hope. However, the program is fraught with ill-defined rules requiring professional help. To ensure your success, our USA Immigration Experts have intimate knowledge of the strategies and regulations of this program and pay close attention to the potential legal vulnerabilities of all applicants. Let us help you reach your dream of becoming an American resident today. Green Card Lottery Registration.